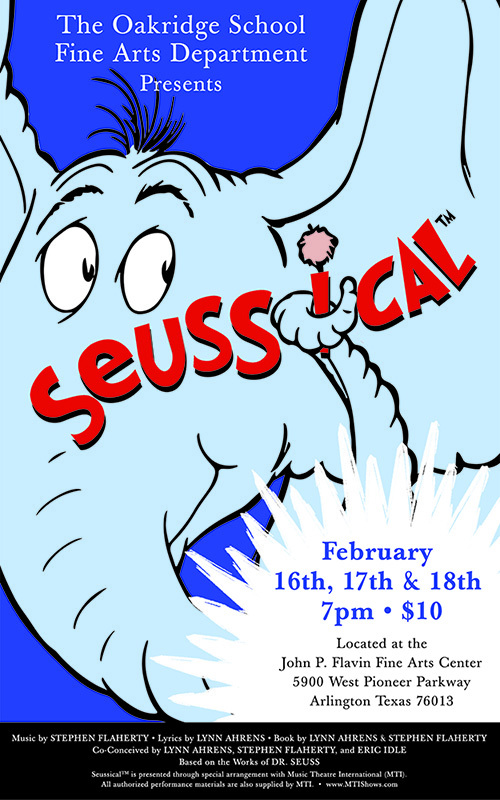 The Oakridge Fine Arts Department presents Seussical, a musical based on the books of Dr. Seuss, on February 16, 17, and 18 at 7:00 p.m. in the John P. Flavin Fine Arts Center. The musical tells the story of Horton, an elephant who discovers a speck of dust that contains the Whos. Horton faces a double challenge: not only must he protect the Whos from a world of naysayers and dangers, but he must guard an abandoned egg left in his care. Although Horton faces ridicule, danger, kidnapping, and a trial, the intrepid Gertrude McFuzz never loses faith in him. Ultimately, the powers of friendship, loyalty, family, and community are challenged and emerge triumphant.